How to Convert MKV to AVI, MKV to MPEG? Current Page: Xilisoft > Video Converter > How to Convert MKV to AVI, MKV to MPEG? Wanna convert MKV to other formats, such as AVI or MPEG? Xilisoft Video Converter is a way for you. It can convert MKV to AVI, MPEG and many other video formats easily. What’s more, you can convert all popular SD/HD/3D videos with 5X faster speed to play on your PSP, PS3, iPod, iPhone, iPad, Apple TV, Xbox, Google phones and other digital multimedia devices with the Xilisoft Video Converter. Also you can edit videos, clip/merge/split files, add watermarks/subtitles/soundtracks, etc. Free download it to have a try. Now let's focus on the guide how to convert MKV to AVI, MKV to MPEG with the Video converter. 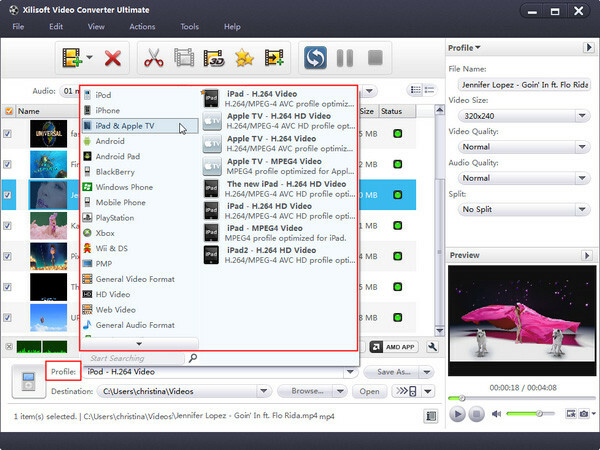 Launch Xilisoft Video Converter, add your MKV file by clicking "Add" in the File menu or in the main interface. By highlighting the MKV file, you can see its info including video codec and audio codec in the recording area. In "Profile" drop down list box, you may select output format. The software allows setting different output formats according to different files. For example, I may set the AVI as output format of the first MKV file, the MPEG as output format of the second MKV one. After selecting certain output format, the right column will show its general standard. By clicking certain settings such as "Start Time", "Video Size", "Video/Audio Bit rate" and so on, you may set it. Now let's select the output folder by clicking the "Browse..." button or directly enter a path in "Destination" drop down list box. Finally, click "Encode" in the File menu. After a successful conversion, the info "Completed" will show. If you're interested in this video converter program, please visit Xilisoft Video Converter to know more functions and features, and free download it to get more enjoyment.